This bone carving is part of the Wisdom Eye Koru series of carvings. It is called 'Found'. This is symbolic of being able to transform ourselves if we are unhappy, into someone who is happy, through 'finding' wisdom. This simple carving has several meanings at different levels. At a basic level, it represents the inner journey which functions to open our 'wisdom' eyes. The ‘eye of wisdom’ is represented by the inlay of Paua shell. The eye has a natural 'pupil' in the inlay formed by the curve of the shell created through the way it has been sanded. This carving is part of the Wisdom Eye Koru series of carvings. It is called 'Found'. This is symbolic of being able to transform ourselves if we are unhappy, into someone who is happy, through 'finding' wisdom. The inner journey of discovery leads to a sense of profound joy. Hence, we find what we ultimately wish for. 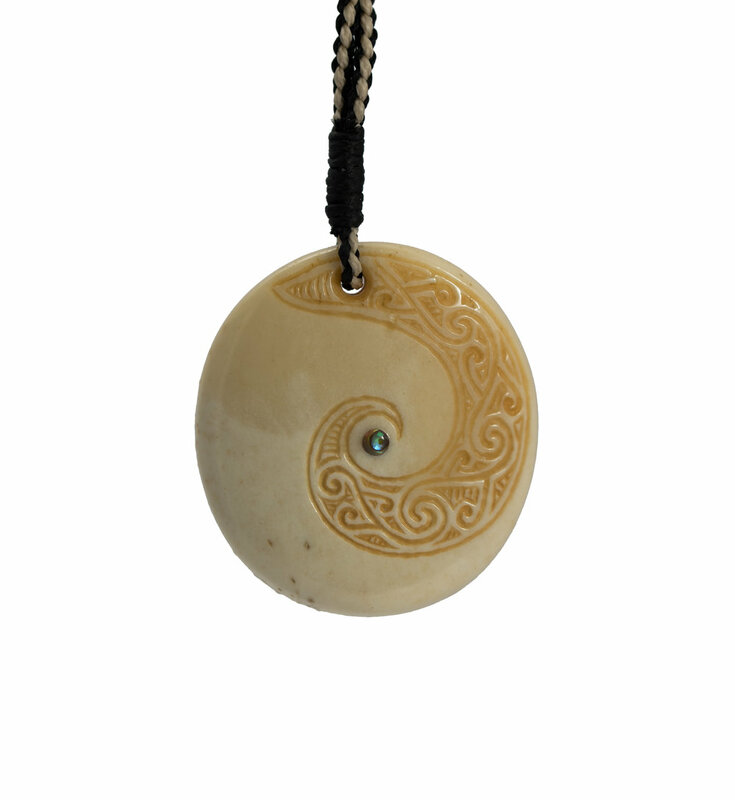 This inner journey is represented by the Koru flowing into towards the centre of the eye. There the front design illistrates a broad river of koru. These koru represent blessings upon our mind. It is our connection to deeper truth. The markings in between the koru represent that which connects us to all things. The motif on the back of the carving is our connection with our ultimate divine nature. When what is above and below are united. The koru symbol is common in New Zealand and is inspired by the unfurling of the new fern fronds. Meanings associated with this are new growth, new beginnings, and spiritual awakening.